I kept my bike stock for a total of 5 days before doing the fender eliminator. I have a feeling more mods will take more time to get done. I'm starting this thread for a place to showcase my build as it goes a long and have a place to ask opinions about the parts I plan to put on it. Here is the list. Fender eliminator is done already. I have a picture today of that. My plan with this build is to get the bike up to around 70mph highway. I'm figuring with the increase in power the 15T sprocket should be able to handle it. This is all theory since I haven't actually started the build yet. I will also get a speedometer re calibrator if I need it, but I saw somewhere on Youtube that the 15T sprocket might actually fix the inherit discrepancy in the speedometer. Big bore kit is also (sort of) an option but I hear they eat fuel. 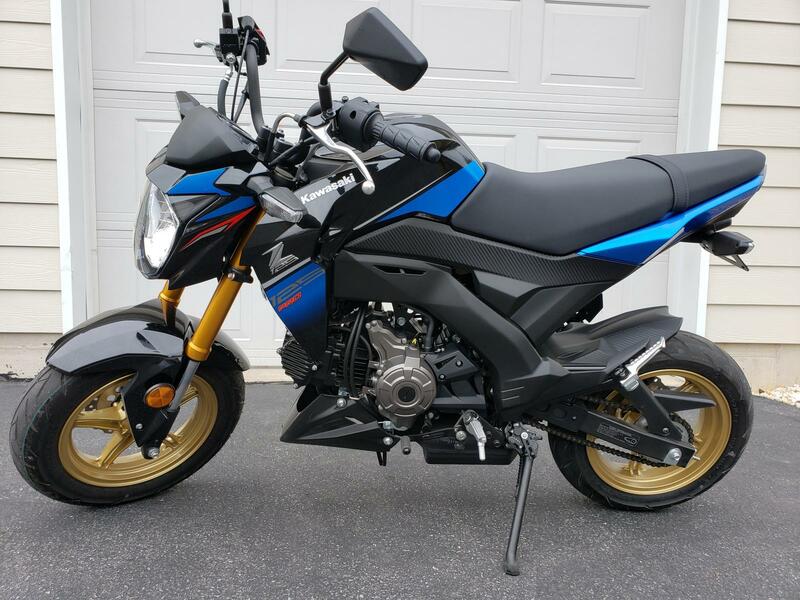 I browsed the builds a little, got some very nice Z125's out there guys. I typically stay away from Two Mother's anything. If you were going to drop $400 on an exhaust, I would get a Yoshi or something a little better quality. If you are staying stock bore, lightened primary and/or speed spacers might free up a little HP, but I wouldn't expect any real gains with the mods you have in your list above. Here he says he's ready to gear the bike taller. I think the only difference in the mods he did was the camshaft upgrade. I'd consider that. Thanks for the vids. I was considering the Two Brother's exhaust because I don't need to weld a pipe for the self mapper since it comes with the correct size from the factory. From 61mph stock to 67 with those few upgrades seems significant to me. Barring the Yoshi exhaust. I'd consider that one too. Anyone have MPG stats from their 143 big bore? If that's not how to get significant increase can you please explain? Two Brother isn't the only exhaust that comes with a M18 (wideband) bung. Off the top of my head, Hindle and Yoshi (new version) both do. I ordered a Zoom Brute exhaust with a M18 bung pre-installed so I didn't have to do any welding. Order from Tommy Davis (look him up on Facebook) and request an M18 wideband bung. He should be able to set you up. If you just order from Amazon, they may send you whatever they have on thier shelf with an M12 bung. Are these the speed spacers you are talking about?? ?